Free Fire Glass with GasLogGuys Gas Logs. Bring your fireplace to the next level with the sparkle of Lakeview fire glass. 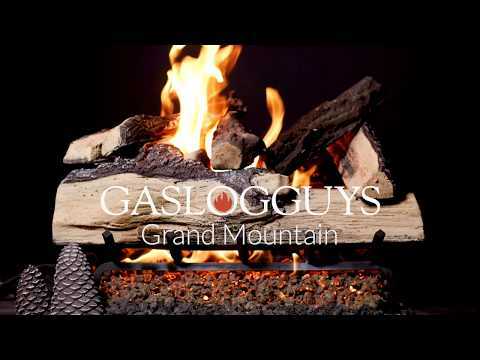 Buy select GasLogGuys gas log sets and receive 10lbs of Lakeview Fire Glass FREE ($30 value!) while supplies last. Nothing creates a warm ambiance in your home quite like wood burning in the fireplace. GasLogGuys combines the look of an authentic wood burning fire and the convenience of gas logs with this realistic, hand-painted log set. The multi-step process used to create these logs ensures that every fine detail is captured. This 24-inch log set features rich bark with gray accents, giving great depth to your logs and perfectly complements the bright, fresh cut look given to the underside of the wood. The pine cone decorations complete the scene and will make your guests think that these logs were just brought in from outside. The exclusive H-shaped burner features two equal sized pipes running right down the middle of the logs, allowing for maximum flames and creating depth to your fire. You will experience a deeper ember bed as flames shoot out from beneath your front log, producing more glowing embers and more fire, which will make your gas logs appear just as visually stunning as an authentic wood burning fire. 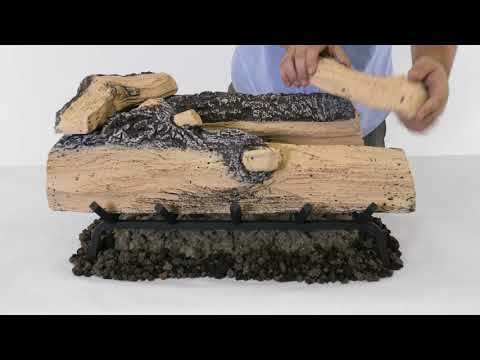 This log set includes the logs, a custom grate, an H-shaped burner, sand, lava rocks, embers, a non-whistling connector kit and damper clamp. This gas log set is intended for use with natural gas only - not to be installed with propane. This set features a variable flame height safety pilot valve that is operated by a switch or the included remote control. 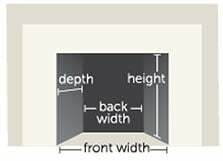 I am looking to change out my vented logs in the fireplace in my new house. Do the log set come with new hardware hie, pipes, tubes etc)? This log set includes a custom grate, an H-shaped burner, sand, lava rocks, embers, a non-whistling connector kit and damper clamp. This product can expose you to chemicals including carbon black, which is known to the State of California to cause cancer and chromium, which is known in the state of California to cause birth defects or other reproductive harm.